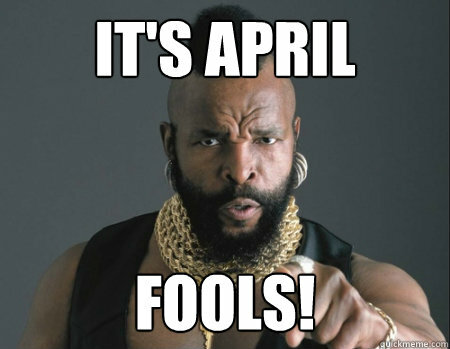 We hope you enjoyed our April fools stories yesterday as much as we did! In our long-standing tradition, we devoted the entire day to fake news and spoofs. We had fun writing them despite the fact that we can't really fool most of you in our thirteenth year of the tradition, even when we start off with some very plausible (yet fake) stories. In case you missed them, you can read yesterday's April Fools stories here. Promises of a new Iron Maiden album, Lamb Of God drummer Chris Adler being replaced by Dave Lombardo, and MetalSucks being bought out by TMZ were the day's most popular faux stories. MetalSucks even liked and shared the last one for kicks. Thanks for reading. We now return to our regularly scheduled metal news programming. Heidevolk Premieres New Lyric Video "Vinland"
5 Comments on "April Fools! Did We Get You?" Not as many articles as in years past, but I enjoyed reading them. The Adler, TMZ, and Wintersun articles were my favs. Thanks! Same thing as Drum_Junkie, great articles, would've like lot more like other years, but still, THANK YOU!!! I agree with Drum, and Blind. Twas a good April fools.